Authentic look and feel the part of a real NASA astronaut. The astronaut costume set includes astronaut jumpsuit , gloves, shiny helmet, reusable name tag and a free America flag pin. Great idea to give it as a gift or a toy to any one who loves to role play or any themed party. Great way to keep your little one busy as he uses his imagination as soar to every planet. 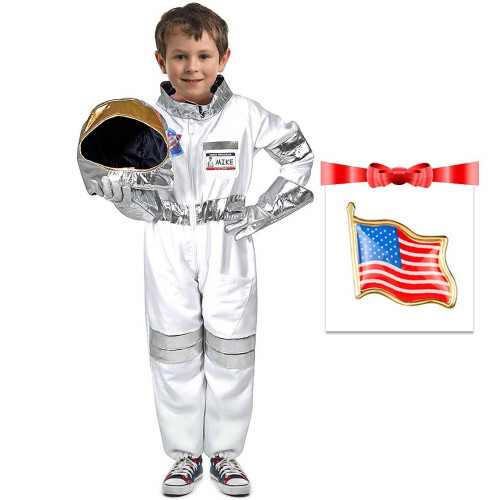 More than a seasonal costume, this beautifully designed role-play astronaut costume set is made of top-quality materials and built to last through countless adventures and year-round imaginative play. It can be worn every day and still stay looking great thanks to washable fabrics and durable construction, and its sized to fit children ages 36so children can keep enjoying it year after year. Meticulous, mom- and kid-tested design means every piece is also easy to put on, comfortable to wear, and perfect for playtime. 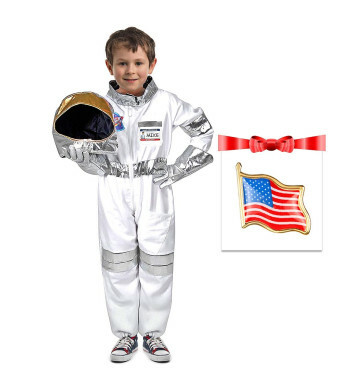 With thoughtful details designed for the way children play, this astronaut role-play set inspire adventures galore. Clever accessories add to the fun, so children dont just dress the part they are inspired to act out a role as they draw inspiration from the set itself and fire up their own imaginations. While creating unique narratives and pretend-play situations, children are also practicing key social skills, such as understanding and accepting different perspectives, trying out new vocabulary and dialog, and anticipating outcomes for the different storyline they create.